Qiagen will commercialize two new fully-integrated systems for automation of PCR (polymerase chain reaction) testing developed by NeuMoDx Molecular in major markets outside the U.S.
Qiagen will commercialize two new fully-integrated systems for automation of PCR (polymerase chain reaction) testing developed by NeuMoDx Molecular in major markets outside the U.S., the companies said today, through a partnership that allows Qiagen to merge with NeuMoDx. The partnership allows Qiagen to acquire all NeuMoDx shares not currently owned by Qiagen at a predetermined price of approximately $234 million—a deal tied to NeuMoDx achieving regulatory and operational milestones. In addition to the merger agreement, the partnership enables Qiagen to distribute the NeuMoDx™ 288 (high-throughput version) and NeuMoDx™ 96 (mid-throughput version) in Europe and other major markets worldwide outside of the U.S. NeuMoDx will commercialize both systems in the U.S.
NeuMoDx 288 holds all the reagents required for up to 30 different assays on board, with up to 42 patient specimens processed per hour, while the NeuMoDx 96 can accommodate up to 20 different tests, according to NeuMoDx. The systems offer unlimited access to process both commercial and LDTs for up to 288 preloaded specimens for the NeuMoDx 288 and up to 96 specimens for the NeuMoDx 96, providing a walkaway time of between 5 and 8 hours. Both NeuMoDx next-generation systems are designed to help clinical molecular diagnostic laboratories process increasing test volumes and deliver more rapid insights on a broad range of diseases, according to the companies. If the companies merge, NeuMoDx would be the second molecular diagnostics developer acquired in recent months by Qiagen. Earlier this year, Qiagen bought STAT-Dx for up to $191 million, in a deal designed to facilitate the buyer's launch of a multiplex platform designed to enable molecular analysis of common syndromes by combining Qiagen chemistries with Stat-Dx’s system based on real-time PCR technology. Qiagen said it intends to start commercializing the NeuMoDx systems at the European Society of Clinical Virology (ESCV) Congress, to be held September 23-26 in Athens, Greece, with an initial assay menu based on the first two CE-IVD marked assays for Group B Streptococcus (GBS) and Chlamydia trachomatis/Neisseria gonorrhoeae (CT/NG) infections. 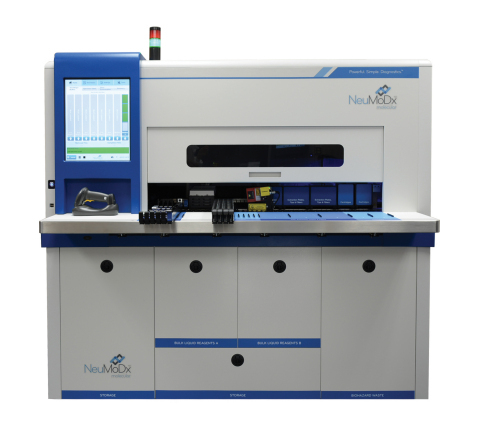 NeuMoDx said its systems offer a growing menu of relevant in vitro diagnostic (IVD) tests, as well as the ability to process both commercial and laboratory-developed tests (LDTs) in the most flexible and efficient manner. Qiagen and NeuMoDx also agreed to partner in incorporating Qiagen chemistries on the NeuMoDx systems.